I’ve started a new tradition of trying to see the Mets play on Opening Day no matter where they’re playing. Last season’s opener at Cincinnati almost didn’t happen---foul, rainy weather that threatened a rain-out and since it was on a Monday, I had to call in sick to work (when in reality I was in Cincy praying that my flight wouldn’t be canceled or the game delayed.) Everything worked out, the Mets won and I even saw a pre-scandal Steve Phillips on my flight home. Fast forward to this year: much less stressful. Took a personal day, great weather, decent nosebleeds seats, got a buzz at the new McFadden’s after the game, even managed to enter the ballpark early enough to receive one of those miniature Citi Field Home Run Apples as a souvenir. 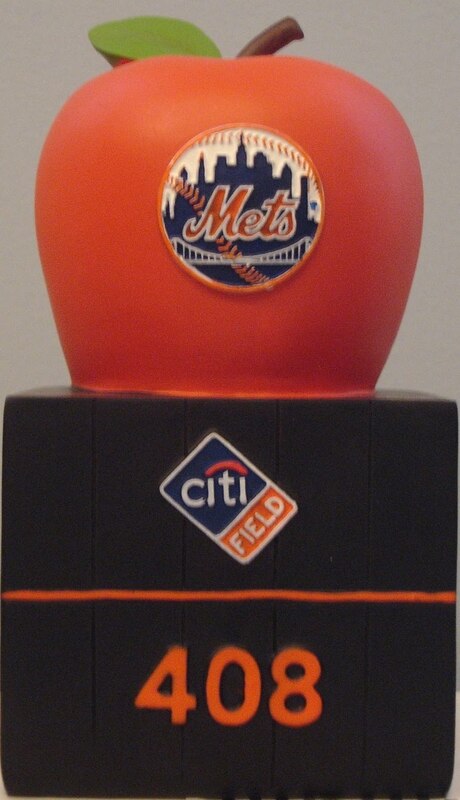 The apple also functions as a bank so I’ve decided to drop a quarter in the slot every time the Mets win. At the moment, there is a whopping fifty cents in there symbolizing their first two victories. If it wasn’t for a game-saving grab by Nationals left fielder Willie Harris in yesterday’s game, I would have accumulated another twenty five cents. Nonetheless, today’s another day and I like my odds with Johan Santana on the mound. In seven career starts against the Nationals, the ace left-hander averages a little more than seven strikeouts a game with a won-lost record of 6-1 and an ERA of 2.63. I would have to say there’s a pretty good chance that I will be adding to my booty. Another reason to feel confident that Santana and the Mets will emerge victorious this afternoon is that their counterpart, right-hander Livan Hernandez, age unknown, will be starting for the Nationals. Hernandez, in 33 career starts against the Mets, has allowed an average of seven hits to go along with a 4.58 ERA. Mets batters are hitting .289 with 25 homers, tied with the most by any major league team. Mets fans will be the first to tell you that on days when Santana doesn’t pitch the likelihood of a Mets win is not so easy to compute. On this day, however, my gut tells me that I’ll be up twenty-five more cents by the end of the day.